If it’s the God of PEACE that will soon crush Satan under our feet, why are we warring so much? Romans 16:20 suggests that the power within us to crush every enemy and every storm in our life is PEACE, not warfare. Are we carriers of this Peace or constantly engaging in battles that never change anything? We have embraced a belief system that puts US at the center of the outcome through our spiritual pursuits, our “anointing” – even our prayers, rather than resting in The One who has the power to still every storm and displace every evil. 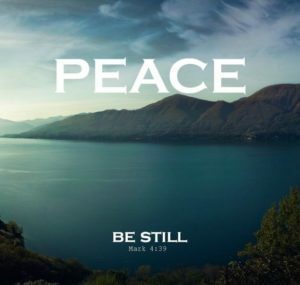 Jesus rebuked the storm with only three words – PEACE, BE STILL (Mark 4:39). There was no striving or threatening; simply a statement of fact. He knew peace because He IS peace. The Prince of Peace is within us and we have this same power to cause storms and chaos to CEASE and DESIST! The only way we can speak this peace is to live from it. Jesus was already SLEEPING THROUGH THE STORM when He spoke the word of peace. Perhaps this is how we can know when we have this latent power at work within us – when we can sleep through the storms. Jesus knew who He was and who His Father was. He had already settled the truth that no power could stop Him from accomplishing His Father’s purposes. We, too, must embrace this truth and not let the storms and chaos around us deter us or steal our peace. When we can learn to rest in the midst of chaos because we know and walk with the Prince of Peace, we can change the atmosphere around us. The Lord is calling us to recognize His Presence and His peace and know the power at work within us. The enemy wants to engage us in a battle that has already been won. The Lord would have us sleep with Him through the storms so that we can speak a supernatural peace into the atmosphere that will stop wars, calm fears, and disarm the enemy. It’s not how you fight your battles that will determine the outcome, but how you rest in the midst of them. Another excellent message, thank you. During a recent hotel stay, the doors in the hallway were banging loudly as I was sleeping. Somehow this wound itself into my dream and I could see person after person come after me with the intent to harm, and they were blocked by some unseen power every time. Yeshua does want us to live in peace. Maybe that is our foremost duty right now… to just settle into it.